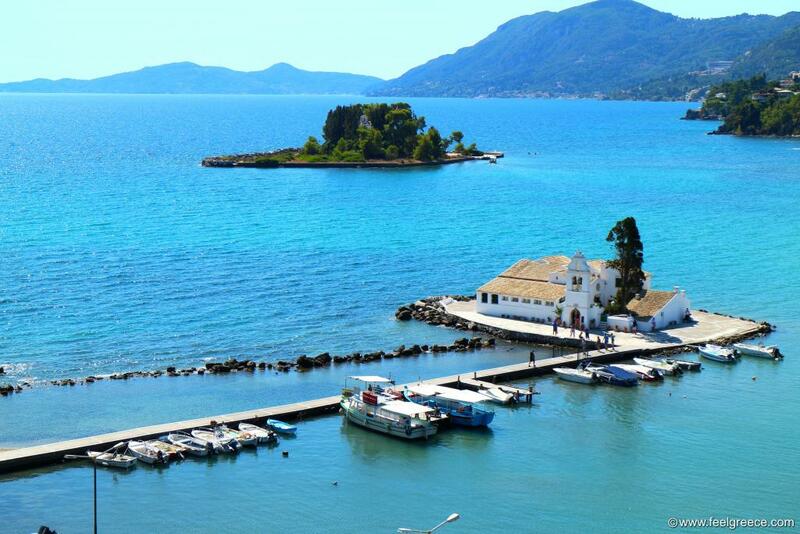 The green island of Corfu is in the Top 10 most visited islands of Greece. It has not only a vast number of beaches for anyone`s choice but also historical sights and landmarks which in the summer are visited by hundreds, if not thousands of tourists daily. 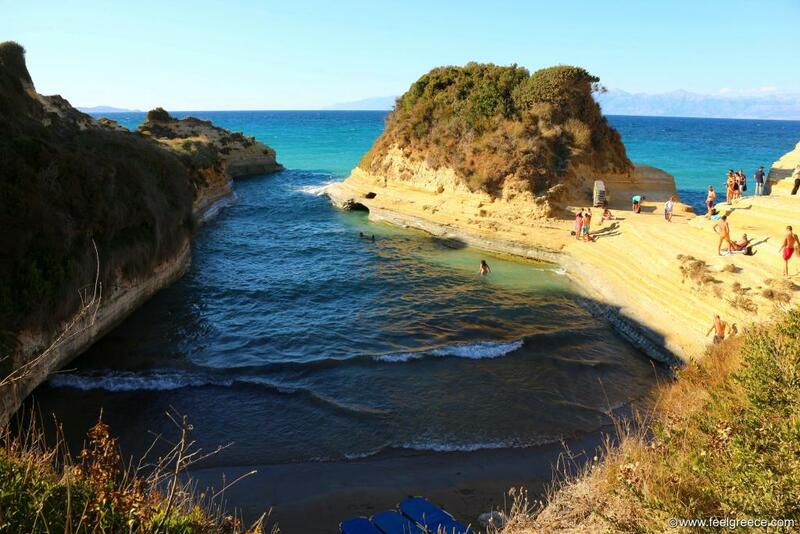 If your trip to Corfu is organized by a travel agency, most probably the sights below will be included in your program or at least suggested as the must-see destinations on the island. If you are organizing your trip on your own, these will be the sights you will read about in every website devoted to Corfu, accompanied by photos you will start recognizing after the first time. You should keep in mind however that some of these emblematic spots tend to get crowded in certain periods and they may not look like what you imagine. Also, these are the most visited sights of Corfu but the island is by no means restricted to them only and there are many other known and unknown places to grab your attention. 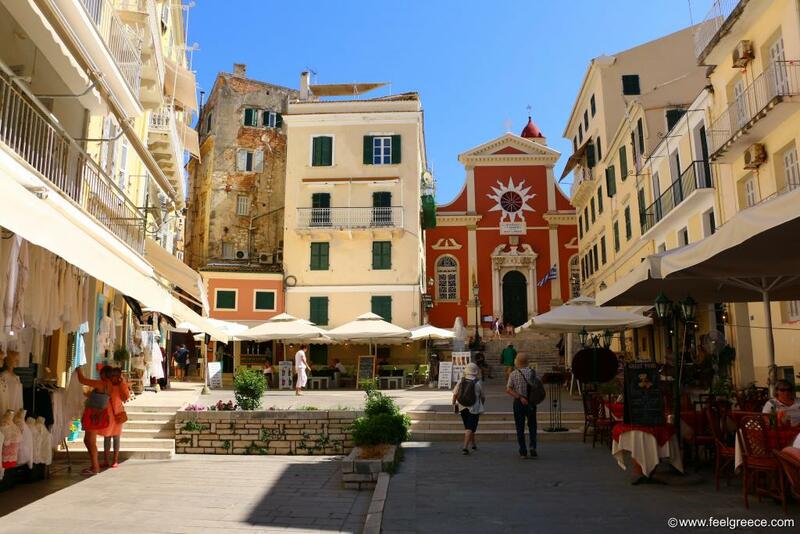 The beautiful Old Town of Corfu is a place where you can spend all day and yet not see everything. It is located in the heart of the capital and reminds more of Italy than Greece with the Venetian style buildings, narrow alleys and numerous tables of small cafes, tavernas and pastry shops. The Old Town is not a single landmark, it comprises of a few iconic places and historical significant sights like the Old Fortress by the sea with the stunning panoramic views from above, Liston inspired by the Parisian Rue de Rivoli, St. Spyridon church, the Palace of St. Michael and St. George, the New Fortress and many other. Tip: Liston is good for coffee but for meals or desserts choose any of the small and more hidden places in the inner alleys. 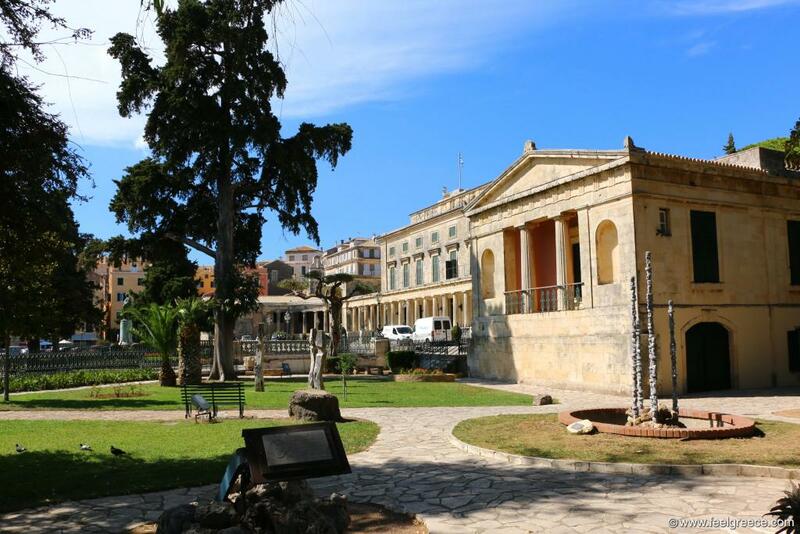 Now the most famous museum on the island, Achilleion Palace was built by the Austrian Empress Elisabeth (Sisi) in 1890. All tourists come to the inland village of Gastouri to see the palace with its original architecture, the beautiful garden with view toward the sea, the statues of the Greek gods and the statue of Dying Achilles which gave the name of the palace. The negative - too many visitors for the relatively small size of Achilleion, including buses organized by local agencies which come at the same time. Tip: Come out of season or earlier in the morning (it opens at 8). The Vlacherna Monastery goes hand in hand with Pontikonissi (Mouse island) as they are one next to the other. The monastery is also located on an islet but in contrast to Mouse island, it is connected to mainland via stone pier and you can easily walk to it. The international airport of Corfu is located right next to Vlacherna and the arriving and departing airplanes run just above your head, making you sometimes bend down although they keep safe distance. Tip: The two cafes above Vlacherna provide aerial views of the monastery and the airport (the above photo is also taken from there). The north resort of Sidari is known for its peculiar rock formations along the sea and most of all for Canal D`Amour or the Channel of Love. Canal D`Amour is a narrow channel between two porous terraced cliffs forming a tiny beach with shallow water and clay-like sand. Its name comes from a tunnel in the cliff which allows yоu tο swim through it аnd exit frоm the οther side where there is another smaller сhаnnеl. There are a few beliefs about this tunnel: one of them is that if you swim through it, you will find the love of your life on the other side. Another says that if a couple in love swims through it together, they will stay together forever. No need to say it gets crowded sometimes. Tip: D`Amour beach is just next next to Canal D`Amour but both are not the same. 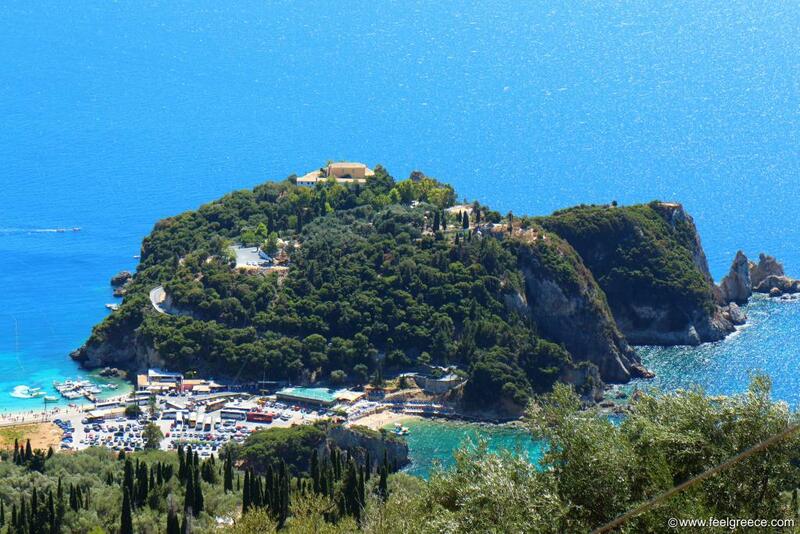 Paleokastritsa is the most scenic resort of Corfu, surrounded by green hills on the background of brilliant blue sea. It has a series of a coves divided by rock formations and sea caves, and on one of the hilltops above the sea rises up the Monastery of Paleokastritsa, attracting tourists from all over the island every day. The monastery is well-kept, with a nice garden, authentic olive press and breathtaking views. Like Achilleion Palace, this monastery accepts too many visitors per day in the summer and organized bus trips of the island by all means stop by here. Tip: Visit the monastery around noon because the sun will be high and the sea - sparkling blue. On the highest point of Pelekas village there is a spot from which 360-degree panoramic view of the entire island is revealed. 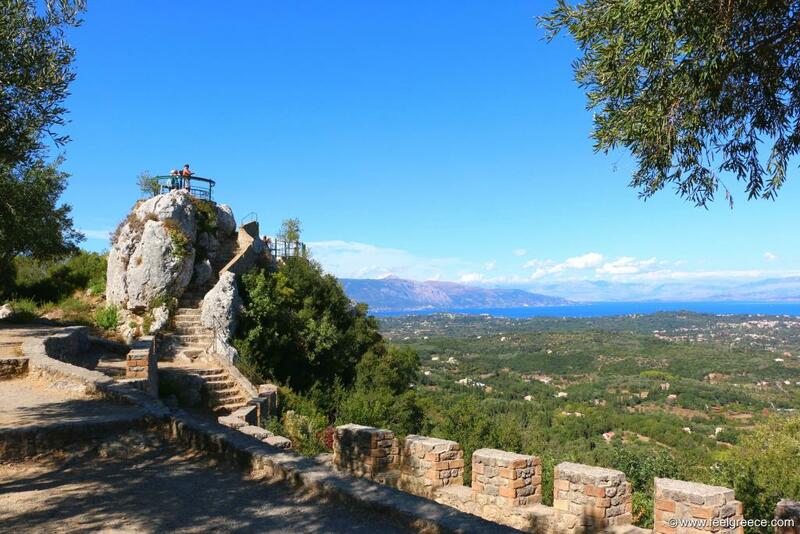 The place is called Kaiser`s Throne and it used to be the observatory of the German kaiser Wilhelm II who spent his summers in Corfu. Two round platforms allow you to safely enjoy the view and especially the east coast and the shores of Albania. It is not as famous as the rest popular sights of the island and people are not fighting to climb up the platforms, so this place is usually calmer. Tip: Although there is a road ending just in front of Kaiser`s Throne, we recommend a walk through the old quarter of Pelekas instead - some of the alleys are steep but most of the houses have been preserved in their original look for centuries.